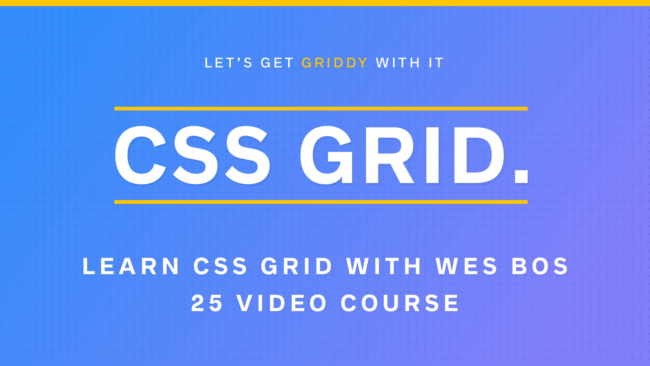 Coding guru and whiz Wes Bos put together a free online course on CSS Grid. I recently finished the course and have to say it was awesome! Like his other courses, Wes focuses on the things that are important and gets right to it. There’s not a lot of chit chat and useless conversation—it’s all about the coding. I followed along with him (he gives all of the exercise files and more) and was really impressed by the way in which we go from zero to a full grid layout in a matter of minutes. He’s so fast in the code editor, you can tell he codes everyday. There were many times I had to pause the videos to catch up. There are 25 lessons and the first 18 – 19 are all about the nuts and bolts of grid and how it works. There are several exercises and explorations on grid properties and situations. Then he progresses into practical applications of grid for responsive design, as an alternative to Bootstrap, for image galleries and more. It really comes together in the last 5 videos. I attended An Event Apart in Boston this May for an all-day workshop Designing Layouts: The New Superpowers of CSS, with Jen Simmons, Designer Advocate at Mozilla. I admit, I was a little skeptical that CSS Grids would be the answer and end all for web layout moving forward. However, after just a few demonstrations and seeing how little code was needed, my jaw hit the floor. Simmons began the day by articulating Writing Modes, which at first myself and other participants were wondering “What does this have to do with CSS Grid?” Globally, about 70% of languages are left-to-right horizontally and top to bottom vertically when reading and writing. Some languages are right-to-left, like Chinese and some are totally different, like Mongolian. Since this applies to web pages, there are ways to control text-direction and other properties to affect the way a page is read. These can be manipulated via CSS. The most important concept that comes out of Writing Modes is Start and End. A block of text starts on left and ends on the right of a row. The start of a column of text is at the top and ends at the bottom. This aspect is also part of the CSS Grid specification. We briefly took a look at support across browsers for CSS Grid. It was a hidden feature for a while, but now is fully supported in the major browsers with partial support for IE and Edge. 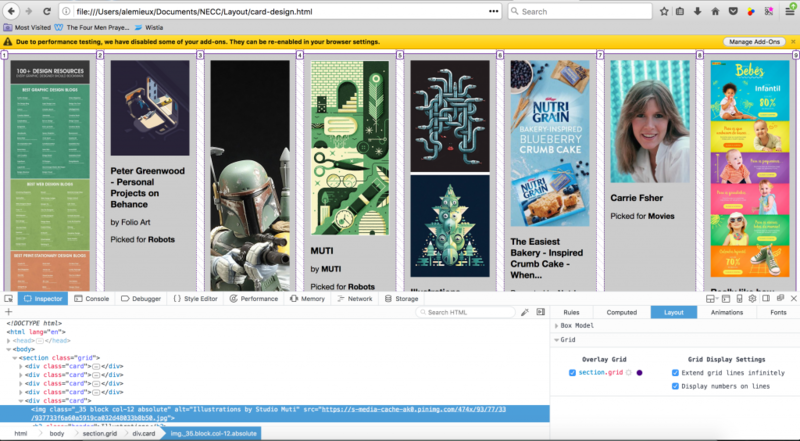 Using the @supports media query though, graceful degradation can be utilized to serve it up to those major browsers while traditional layout methods are used in the main stylesheet for all the rest. As dismal as that sounds, the arguments for the grid are so compelling that I think a majority of designers will push for it and get on board with the code sooner than later. Something to note is that this is not a replacement for Flexbox. Flexbox has its place in web development and can be used in conjunction with the grid. The grid consists of Grid tracks, grid items, grid cells, grid areas, grid lines and grid gaps. Grid tracks are either grid columns or grid rows. Grid lines are important and not visible when you enable the grid. If you download Firefox Nightly though, you can enable the Layout Panel, which can show you the grid lines, which is very helpful when trying to understand CSS Grid. Starting off with a basic example. This is just a basic unordered list which would normally appear as a vertical list of text. By adding display: grid to the ul (container), we can then set up the grid using grid-template-columns: repeat(3, 1fr); This sets up a 3-column grid with each column being 1/3 of the width. The browser does all of the calculations and gives equal widths to each column and if needed, automatically gives us rows for when there are more the 3 elements in the list. We could’ve specified the grid-template-columns as 1fr 1fr 1fr, but the repeat syntax does this for us. 1fr is a new unit which is a fraction unit. We can also specify columns in pixels, ems, percentages too. Try changing the grid-template-columns to 1fr, 200px, 5em. The browser will first calculate the space needed for the second and third columns and the attribute the rest of the space to the first column. The other aspect of the grid that’s specified in this example is the grid-gap, which gives us the white space between the grid tracks. When flexing the browser width, the grid cells are flexible. See the Pen CSS-Grid Simple Example by Al Lemieux (@alemieux) on CodePen. In this next example we can also use the grid to explicitly place elements into grid cells. This is where grid-column-start and grid-column-end, grid-row-start and grid-row-end come into play. The grid is set up on the container (again an unordered list) and each list item is sent to a specific cell in the grid with grid-column and grid-row. Grid-column: 1 / 2 means start on grid line 1 and end on grid line 2. If you play with the designation of each rule, you can change the location of the items on the grid. See the Pen CSS-Grid Explicit Placement by Al Lemieux (@alemieux) on CodePen. 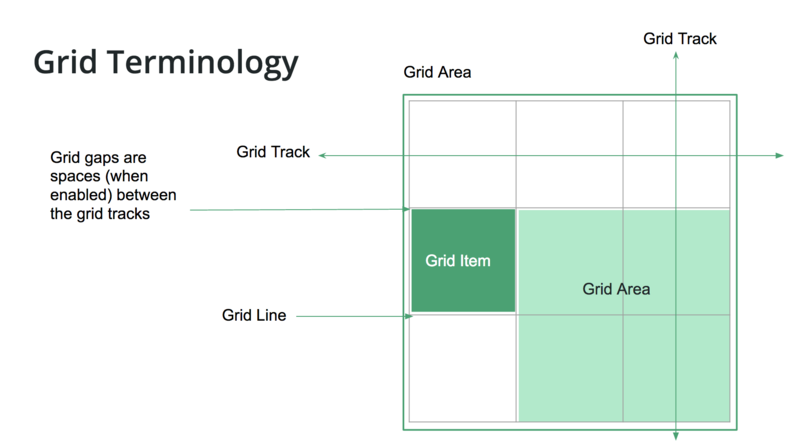 The named grid area names are then used in the grid container to define the areas for layout. See the Pen CSS-Grid Named Areas by Al Lemieux (@alemieux) on CodePen. I’m still playing around with the concepts and wrapping my head around the code. All of the examples I’ve built so far are a lot easier than floating elements, worrying about their container collapsing, or relative and absolute positioning. With minimal code, a layout can be achieved rapidly with minimal issues. More complex layouts might be more challenging, but I’m open for that. The next version of Bootstrap will have the grid built into it and I imagine that a lot of CMS themes will come out soon taking advantage of CSS Grid. I highly recommend checking out Jen Simmons’ labs site labs.jensimmons.com for a variety of examples and resources. There’s also Rachel Andrews site Grid By Example, which is good source for examples. Also, check out the fun and informative game that helps you learn CSS Grid CSS Grid Garden. Redesigning my own personal site is something I’ve been wrestling with for some time now. Do I highlight my web skills, my Flash skills, my personal art? How do I sell my services, etc. I almost wish there were someone else who would design and market the hell out of it. Anyway, there’s a great article about this topic by Lea Alcantara at A List Apart. It’s a great read, so check it out. And maybe it is time for a design refresh. Find out about a cool feature for placing multiple images in InDesign. A List Apart has released its 2007 Web Design Survey.